The U.S. has its grain and tobacco subsidies, the European Union has its controversial common agricultural policy (CAP), and Japan has its fair share of measures to protect farmers’ incomes. Indonesia recently had to slash a long-standing subsidy provided to fuel users (not producers). All of the above examples of heavy-handed government involvement in the market have resulted in political pressure, financial stress and severe disruptions to market mechanisms – distorting both supply and price. Back in 2011, the new Thai government of Yingluck Shinawatra introduced a campaign promise entailing a de facto subsidy in the form of a rice-purchasing scene that set prices at 40-50% above the prevailing market price. The subsequent financial commitment has generated a large black hole in the government’s accounts, and has already resulted in a loss of USD$4.4 billion in the year from September 2011 to September 2012, almost certainly with worse to be announced for the current year come autumn. 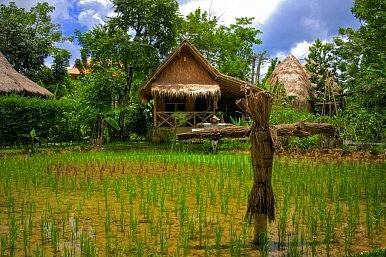 Like other countries that have introduced such “populist” measures, Bangkok now finds itself in a difficult bind: The distortions created by the policy have already started to affect sentiment about Thailand’s sovereign debt rating, created a 15.5 million ton “rice mountain” to rival Europe’s infamous CAP-associated surpluses, and are soon set to further affect world markets as the government must sell down its surplus to clear room for…more loss-making rice stockpiles. So can Bangkok cut the government set purchase price? Not so fast! Despite an effort to head-off risks to its sovereign credit rating after a warning from Moody’s, the Yingluck government was forced to make an embarrassing u-turn in the face of the ensuing protests by Thailand’s farmers. The extreme premium being paid by the government in its rice purchasing scheme has translated directly into a sooner-than-expected addiction in the once proud rice producing sector. Hence allegations of fraud and dishonesty about malpractice (for example the mis-selling of lower quality or cheaper foreign produced rice to the government scheme) are the least of Bangkok’s worries. As the government prepares to sell down its “mountain”, not only will it realize its loss, but the downward impact on world rice prices will negatively impact rice producers elsewhere, probably increasing trade tensions and doing nothing to impact Thailand’s international standing. Hence a core political promise – one that played no small part in Yingluck’s rise to power two years ago – has become a sword of Damocles hanging over the government’s head. The scheme represents a large transfer of wealth from the government (i.e., the public) to rice farmers. Cushioned from competition and gradually becoming reliant on the scheme, history would now suggest that the latter will now become increasingly inefficient, even as their political importance is now cemented in the scheme. History also points to Thailand’s economy suffering as resource allocation (including labor and financing) becomes sub-optimal. If Thailand wants to avoid the fate of the kind of populist policy-driven economic disasters that have plagued Latin America, it would be wise to take the politically difficult decision to reduce this subsidy sooner rather than later. Unfortunately history also suggests that this will be extremely difficult to do.